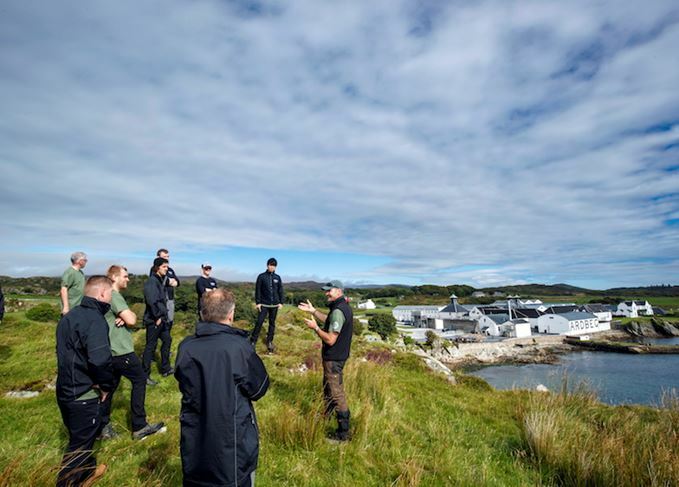 Ten contestants from six countries are competing in a three-day survival course hosted by single malt Ardbeg on the isle of Islay – dubbed ‘the world’s most daring whisky challenge’. The three-day Ultimate Ardbeg Ardventurer challenge, which concludes today (8 September), sees 10 contestants – fans of Ardbeg, journalists, commentators and bloggers – vying for the title of Ultimate Ardbeg Ardventurer. Led by distillery manager Mickey Heads and survival expert Monty Halls, they have faced a number of ‘intrepid’ challenges on Islay, armed only with essential supplies and a ration pack inspired by the flavours of Ardbeg. The pack includes: a bottle of Ardbeg 10-year-old, a bar of soap, a line of tarry rope, a tin of sardines, iodine, lime, peat, Vicks VapoRub (menthol), cheese, smoky bacon, black pepper, chocolate, aniseed, almonds and matches. The challenge began with an apprenticeship at the Ardbeg distillery before a hike to the distillery’s water source, Loch Uigeadail – carrying a 12kg pack – and a day cutting peat. Finally, the contestants row a cask of whisky along Islay’s coast – all the while being ranked by Heads and Halls for ‘Ardbeggian’ qualities of endurance and resourcefulness. ‘It’ll be fascinating to see how each Ardventurer will react to the wild, untamed nature of Islay,’ said Heads. People will be able to book their own, individually tailored Ardventurer experience from 9 September, with prices starting at £12,000. As the Islay distillery’s manager marks 10 years at the helm, Richard Woodard looks back. Fans are asked to raise a glass and toast the distillery manager’s 10-year anniversary. Ardbeg Day became Ardbeg Night with tales of smugglers and a Fèis bottling called Dark Cove. The Islay single malt’s 21-year-old Committee release recalls its near-extinction in the 1990s. The 23-year-old Islay malt was filled into cask at a difficult time for the distillery.